Sutter Street Railway train on Sutter Street in the Western Addition about 1902. 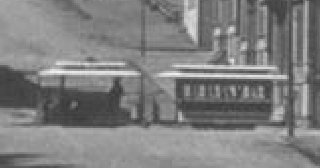 Detail of a larger photograph (Source: [volume 6:group 11:105], Roy D. Graves Pictorial Collection, ca. 1850-ca. 1968, BANC PIC 1905.17500--ALB, The Bancroft Library, University of California, Berkeley). The main character of Frank Norris' naturalistic novel McTeague lived on Polk Street in San Francisco, along the Polk/Larkin line of the Sutter Street Railway. In these excerpts from Chapter One, the cable car line is an important part of the scene. The street never failed to interest him. It was one of those cross streets peculiar to Western cities, situated in the heart of the residence quarter, but occupied by small tradespeople who lived in the rooms above their shops. There were corner drug stores with huge jars of red, yellow, and green liquids in their windows, very brave and gay; stationers' stores, where illustrated weeklies were tacked upon bulletin boards; barber shops with cigar stands in their vestibules; sad-looking plumbers' offices; cheap restaurants, in whose windows one saw piles of unopened oysters weighted down by cubes of ice, and china pigs and cows knee deep in layers of white beans. At one end of the street McTeague could see the huge power-house of the cable line. Immediately opposite him was a great market; while farther on, over the chimney stacks of the intervening houses, the glass roof of some huge public baths glittered like crystal in the afternoon sun. Underneath him the branch post-office was opening its doors, as was its custom between two and three o'clock on Sunday afternoons. An acrid odor of ink rose upward to him. Occasionally a cable car passed, trundling heavily, with a strident whirring of jostled glass windows. On week days the street was very lively. It woke to its work about seven o'clock, at the time when the newsboys made their appearance together with the day laborers. The laborers went trudging past in a straggling file--plumbers' apprentices, their pockets stuffed with sections of lead pipe, tweezers, and pliers; carpenters, carrying nothing but their little pasteboard lunch baskets painted to imitate leather; gangs of street workers, their overalls soiled with yellow clay, their picks and long-handled shovels over their shoulders; plasterers, spotted with lime from head to foot. This little army of workers, tramping steadily in one direction, met and mingled with other toilers of a different description--conductors and "swing men" of the cable company going on duty; heavy-eyed night clerks from the drug stores on their way home to sleep; roundsmen returning to the precinct police station to make their night report, and Chinese market gardeners teetering past under their heavy baskets. The cable cars began to fill up; all along the street could be seen the shopkeepers taking down their shutters. Between seven and eight the street breakfasted. Now and then a waiter from one of the cheap restaurants crossed from one sidewalk to the other, balancing on one palm a tray covered with a napkin. Everywhere was the smell of coffee and of frying steaks. A little later, following in the path of the day laborers, came the clerks and shop girls, dressed with a certain cheap smartness, always in a hurry, glancing apprehensively at the power-house clock. Their employers followed an hour or so later--on the cable cars for the most part whiskered gentlemen with huge stomachs, reading the morning papers with great gravity; bank cashiers and insurance clerks with flowers in their buttonholes. From noon to evening the population of the street was of a mixed character. The street was busiest at that time; a vast and prolonged murmur arose--the mingled shuffling of feet, the rattle of wheels, the heavy trundling of cable cars. At four o'clock the school children once more swarmed the sidewalks, again disappearing with surprising suddenness. At six the great homeward march commenced; the cars were crowded, the laborers thronged the sidewalks, the newsboys chanted the evening papers. Then all at once the street fell quiet; hardly a soul was in sight; the sidewalks were deserted. It was supper hour. Evening began; and one by one a multitude of lights, from the demoniac glare of the druggists' windows to the dazzling blue whiteness of the electric globes, grew thick from street corner to street corner. Once more the street was crowded. Now there was no thought but for amusement. The cable cars were loaded with theatre-goers--men in high hats and young girls in furred opera cloaks. On the sidewalks were groups and couples--the plumbers' apprentices, the girls of the ribbon counters, the little families that lived on the second stories over their shops, the dressmakers, the small doctors, the harness- makers--all the various inhabitants of the street were abroad, strolling idly from shop window to shop window, taking the air after the day's work. Groups of girls collected on the corners, talking and laughing very loud, making remarks upon the young men that passed them. The tamale men appeared. A band of Salvationists began to sing before a saloon. Then, little by little, Polk Street dropped back to solitude. Eleven o'clock struck from the power-house clock. Lights were extinguished. At one o'clock the cable stopped, leaving an abrupt silence in the air. All at once it seemed very still. The ugly noises were the occasional footfalls of a policeman and the persistent calling of ducks and geese in the closed market. The street was asleep. 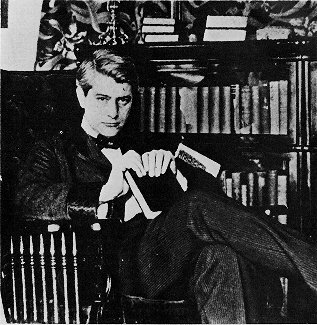 Frank Norris published McTeague in 1899. The full text is available at the Electronic Bookshelf (Source: The Barbary MUSH Photo Archive). Go to Sutter St Ry. Go to SF cable car lines in detail. Copyright 1996-2002 by Joe Thompson. All rights reserved.